To me, the secret of Netflix’s remarkable success isn’t just that it has mastered the technology of movie distribution. It’s that it helps its customers master the art of movie selection. The company does better because it makes its customers smarter–ansd that’s an idea that any company can apply. Read the article here. Do You Feel the LUV? The folks at BNET, the CBS Interactive Network, have asked me to write a weekly leadership blog. You can read my first post here. It’s all about my favorite company in the world, one about which I’ve written extensively in the past, and that teaches all sorts of lessons about leadership, innovation, and how to keep flying high in a turbulent industry. Enjoy! So over on my Harvard Business Review blog, I make the case that we undervalue to our peril one of America’s great exports—disruptive business models that take on established competitors and reshape the sense of what’s possible in whole industries. You can read the blog here. Right or wrong, all the ideas were Made in the USA! Arkadi Kuhlmann, CEO of ING Direct USA, is one of my favorite business leaders and innovators. Polly LaBarre and I wrote about him extensively in Mavericks at Work, and I’ve stayed in touch with him in the years since. He is the face of business at its best: pro-customer, anti-establishment, willing (even eager) try try new ideas and shake things up. I know Arkadi. He means it. And he’s got my vote! I urge you to read the interview. Well, not really. But the November 2010 issue of Fast Company represents the 150th issue in the history of the magazine. Wow, do I feel old. To commemorate the milestone, the staff has compiled some of the best articles from the old days. Happy 150th, Fast Company! My latest post for Harvard Business Review is a little different. It’s a story of my plan to get my Dad a special gift for his 75th birthday, his disappointing experience with a Cadillac dealer, a surprising gesture from a Buick dealer, and what it means for business and success. One of those little stories that offers some pretty big lessons. You can read it here. One of the great things about what I do is that I get to meet and learn from innovators who operate so far out on the edge, who think so differently from everyone else in their field, that they are truly one-of-a-kind characters—radicals in the best sense of the word. Exhibit A is Vernon Hill, the founder and longtime CEO of Commerce Bank, who Polly LaBarre and I wrote about in Mavericks at Work. At Commerce, Vernon and his colleagues reimagined what the experience of retail banking could be like, and they built a booming bank that sold for $8.5 billion in the process. Now he’s bringing his radical ideas to a new market—London. According to this fabulous profile in Fortune, Vernon’s MetroBank—the first new bank licensed in the UK in the last 138 years!—is shaking up the British market just like Commerce did in the US. The piece is worth a careful read. It confirms one of the core arguments in Practically Radical: You can’t do big things if you’re content with doing things just a little better than everyone else. The game is not to out-compete your rivals. It is to unleash one-of-a-kind ideas in a world filled with me-too thinking. Go, Vernon! 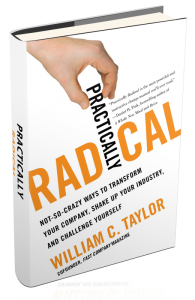 It is with great pleasure that I announce the official publication date of my new book, Practically Radical: Not-So-Crazy Ways to Transform Your Company, Shake Up Your Industry, and Challenge Yourself. The date is Tuesday January 4, 2011–85 days from today, and the first business day of the New Year. That’s right, as soon as you get back to work next year, you can get to work on changing the game. I’ll be busy on this blog between now and then—spotlighting some of the main ideas in the book, introducing you to some of my favorite characters, and otherwise sharing what I learned in the two years I spent studying 25 organizations, in all sorts of different fields, who are making big positive change in difficult times. To get a taste of what the book has to offer, be sure to download and share the Practically Radical Preview, which is right here on the home page. I hope you enjoy and benefit from the ideas you find on this blog and in the book, and I hope you’ll share your ideas with me. Let’s get the conversation started!